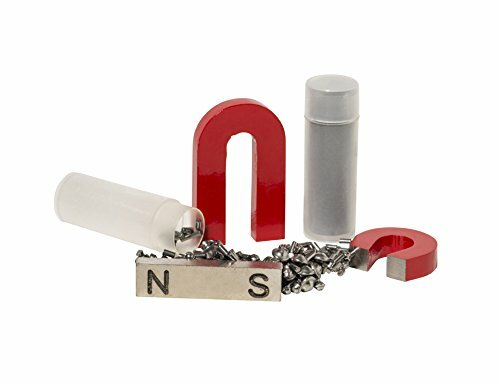 Teach children about the invisible power of magnetism with the 4M Magnet Science Kit. 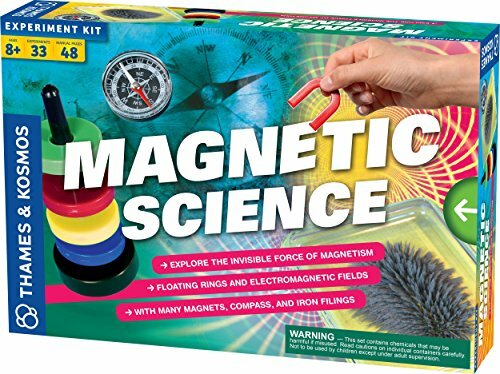 The Magnet Science Kit teaches young scientists about the effects of magnetism through a combination of fun science experiments and games. 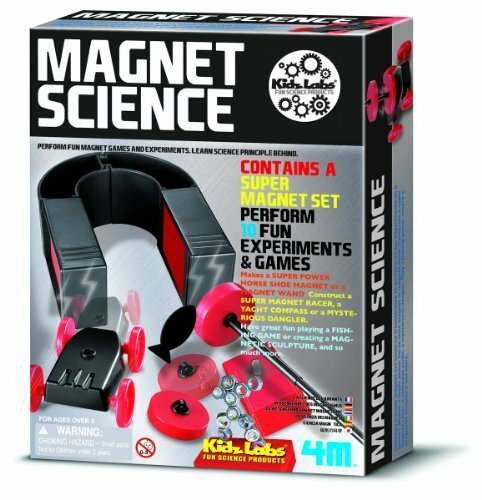 The kit contains materials to make interactive magnetic objects like the Super Power Horseshoe Magnet and the Magnet Wand. Construct Super Magnet Racer, a Yacht Compass, or a Mysterious Dangler. Activities like the Fishing Game provide hours of fun and provide hands-on learning about the effects of magnetism. Recommended for ages 8 years and up. 665050 Features: -Experiments to determine which materials are magnetic.-Learn about magnetic poles and magnetic fields.-Discover how Earth behaves like one giant magnet.-Compasses to take advantage of this phenomenon to determine which way is north.-Conduct a series of experiments to learn first.-Magnets behave and interact under different conditions.-Make invisible magnetic fields visible using iron filings in an enclosed transparent box.-Build an electromagnet to learn how electricity relates to magnetism.-Finally, have some fun with what you have learned by playing some games with magnets. Color/Finish: -Full-color, 48-page manual guides experiments with illustrated step-by-step instructions. Explore the science behind magnetism! Use real lab tools and materials to perform amazing experiments and experience what it's like to think like a scientist or an engineer. 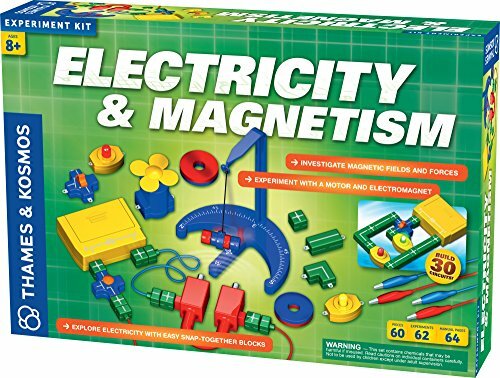 Kids will Float magnets, move trains, create compasses, and more, becoming an expert in all things magnetic. The fact-filled Guide is chock-full of pictures and information needed for hours of experimentation in your very own home laboratory! stem at play kits bring science concepts to life through hands-on activities Designed to spark interest, inspire confidence, and prompt creative critical-thinking skills while fostering collaboration between children and adults. Stem at play kits provide materials to support Scholastic goals while keeping at-home learning fun. Physics is a practical science. Good quality, appropriate physics activities and investigations are not just motivational and fun: They can also sharpen students' powers of observation, stimulating questions. And they are the key to enhanced learning, clarification and consolidation of theory. 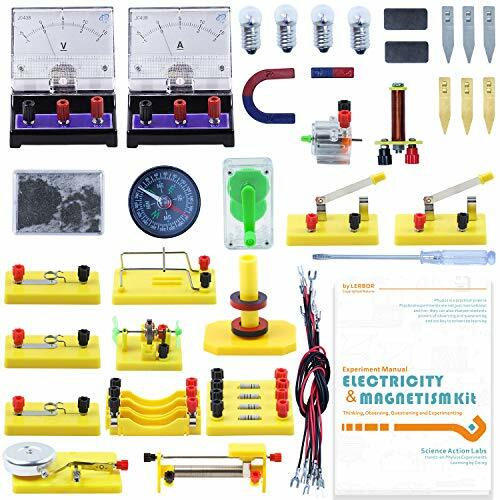 You will need 3PCS AA batteries to do the experiments in this kit. Component List: - Electricity: (31 items) 1 x Ammeter (0.6A, 3A) 1 x Voltmeter (3V, 15V) 4 x Lightbulb 3 x Lightbulb Holder 2 x Switch 3 x Battery Holder 1 x Resistor Module (5-Ω, 10-Ω, 20-Ω, Unknown) 1 x Potentiometer 3 x Copper Electrodes 3 x Zinc Electrodes 1 x Screwdriver 8 x Wire- Magnetism: (18 items) 1 x Bar Magnet 1 x Horseshoe Magnet 2 x Circle Magnet 2 x Permanent Magnet 1 x Compass 1 x Iron Filing Box 1 x Solenoid 1 x Copper Rod 1 x Double Rail Module 1 x Electric Motor Model 2 x Fan Blade 1 x Electric Motor 1 x Hand Crank 1 x Electric Bell Model 1 x Stand Special Offer (1 item) 1 x Full-color Manual (40 pages)The MANUAL comes with this kit and can be also downloaded from http://bit.ly/Manual_Multilingual_EMThis kit is made in China so there are several Chinese characters on only 3 pcs of components. However they are actually not a problem at all while you are exploring the physics electronics world. A kit of magnets and accessories in a compartmental storage tray. Contents: 1 Horseshoe magnet with keeper, 100mm 2 Ceramic bar magnets 75 mm Long. 3 Ceramic ring magnets, 38 mm dia, face polarised. 2 Plotting compasses, clear both sides, 19 mm dia. 1 Pack Iron Filing. 1 Pc. Each of square iron, aluminium, zinc and copper metal. This is the perfect kit for homeschooling, science fair, elementary science, and in classroom demonstrations. 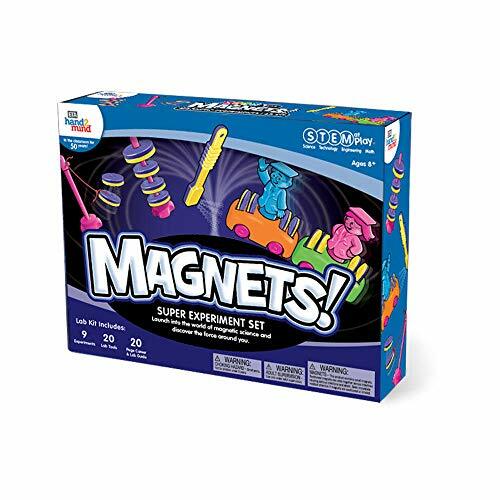 Wave the magic magnet wand to experience simple magnetic attractions! 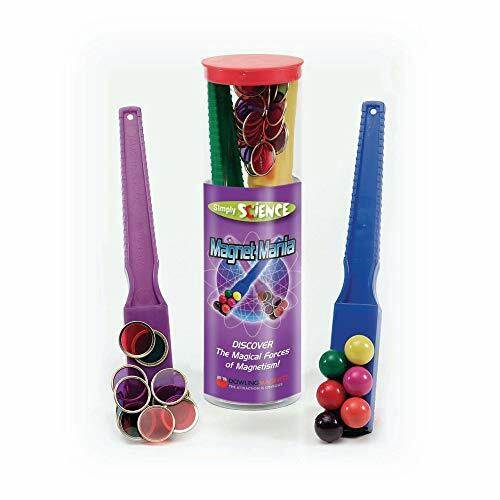 simple activities, combined with brightly colored wands and accessories, give children a positively fun first experience with magnetic attractions. Wand measures 7.63"L. Ideal for ages 4 and up. 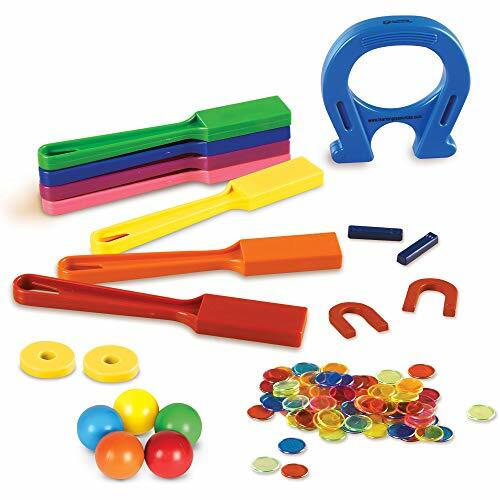 Kit includes: 2 magnetic wands, 10 magnet marbles, 50 metal-rimmed counting chips and activity booklet. 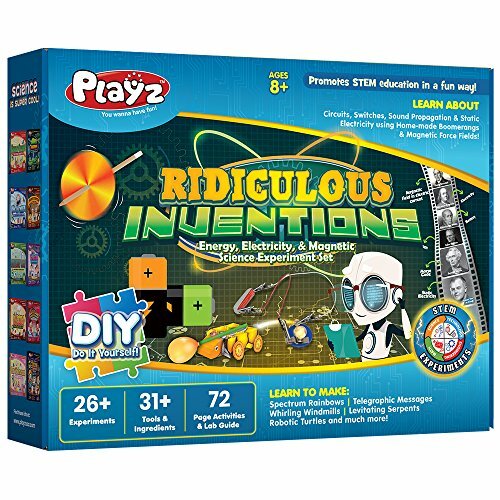 Playz science kits provide children with a fun and educational way to learn about different classroom subjects through unique and exciting science experiments that helps foster A+ grades in school!